EFFECTIVE WORKOUT REQUIRES 2 RESISTANCE LEVELS » Don’t limit yourself to only one resistance level! Sizing is the key – choose the set (M+L or L+XL) which fit your weight. Our experience shows that diversity in exercises with 2 difficulty levels improves exercise technique and increases workout results dramatically! NO NEED for more than 2 sizes, as the range of resistance will be too high and useless. UNIQUE COTTON + LATEX BLEND » The secret ratio between cotton and latex creates the most durable, SOFT-TOUCH and NON-SLIP booty band ever. 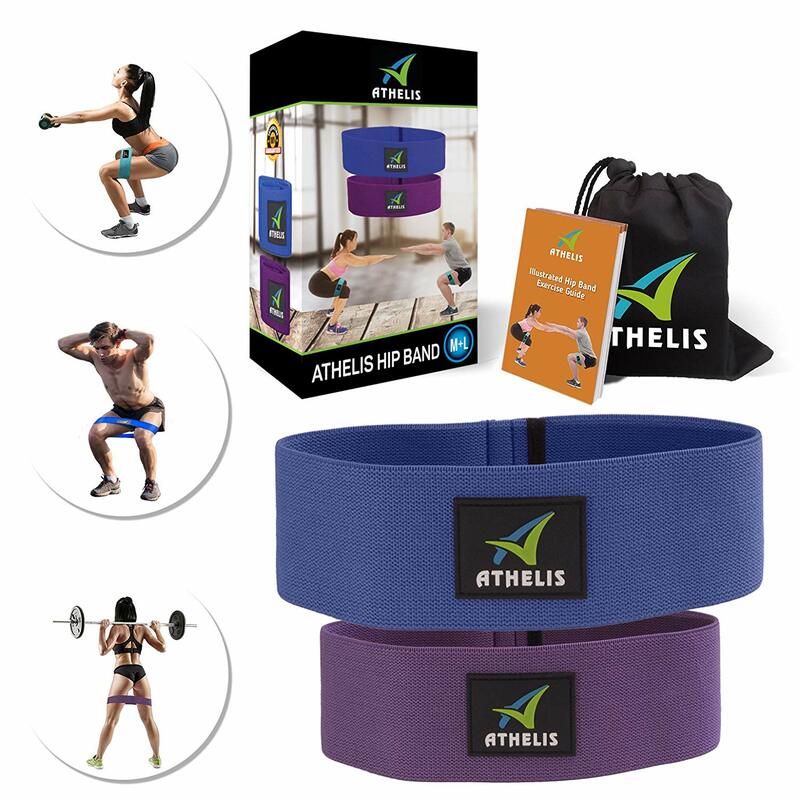 Unlike other exercise bands which include rubber, our hip band stays flat and will not roll after couple of uses nor lose its elasticity. Will never irritate your skin or rip your legs hair off as the cheap mini resistance bands do. Remember: A comfortable exercise band is a one you’ll keep using FOR YEARS. VERSATILE WORKOUT TYPES FOR HEALTHIER BALANCED BODY » Can be used for any type of workout, from warm-ups to high intensity exercises: Squats, Cross Training, Yoga, Pilates, Deadlifts, Weightlifting, Powerlifting, Cross Fit and Beach Body workouts. The circle band improves hip and knee joint stabilization. This, in turn, improves overall body mechanics & movement efficiency during workout. Daily used by physical therapists and personal trainers as an injury prevention or rehabilitation tool. MONEY-BACK GUARANTEE » These popular hip resistance circles are used worldwide by athletes and personal trainers. We’re so sure our unique model works great hence your purchase is backed by a 120-DAYS GUARANTEE! NO QUESTIONS ASKED.